Many thanks for the invaluable resource of your blog when it comes to style. I started reading a month or so ago and am taking pleasure in devouring the wealth of information there is on classic sartorial menswear. However, the occasions on which I am required to wear a suit are extremely limited (I am a student) and, while I cannot wait to see the day when I will be free to wear a suit more often and the doors this will open for experimentation, it would be of great help if you could provide some more information on how to dress casually, in terms of different ensembles one could come up with to avoid looking the same every day. 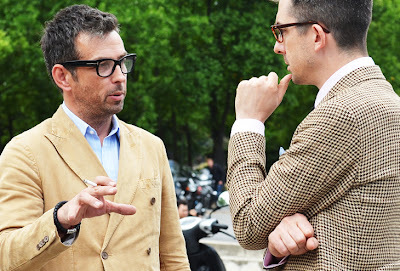 The posts I have found most helpful thus far have been ‘The modern man needs a good blazer’ and ‘Reader question: what do you wear at the weekend?‘ I want to leave behind the hoodies and printed T-shirts of my youth and start dressing like a grownup, though not in a suit. I’ve had a think about this and I think I can summarise my main points about dressing casually in three bullets. There are many others around accessories, colour, texture etc, but hopefully those are pulled out in other posts. I wrote about this a couple of years ago in the post ‘Why men are scared of real trousers’. The key is to move away from jeans, though not abandon them entirely, and to make sure all such trousers have a simple, straight cut. Nothing fashion-led, nothing ripped or overly distressed, just a simple style and fitting well on the waist. With jeans, try buying raw denim that will then gently wear with you and how you wear them. I like Albam myself, and they’re good value. With other trousers, get some good chinos. Start with the classic cream and then expand into tan, green and brown. Again, simple with a straight cut. The difference between smart and casual can be demonstrated by Incotex, my favourite brand here. Their standard range is smart and clean, but the Red line is distressed and far more casual as a result. It’s easy to make do with wearing a shirt or T-shirt the whole year, just putting on a jacket if it’s cold outside and a sweater if it’s cold inside and colder outside. Don’t. Wearing a jacket or any substitute – cardigan, vest, light sweater – instantly elevates you above scruffy teenager. Obviously, a jacket is the best of all. If tailored, it can be soft and casual in cashmere or washed cotton (try Boglioli). If not, many stores now do jackets in cotton or wool jersey – Zara and Reiss do them, and Massimo Dutti is a good source for anything a little more mature in style. And at the higher end, go to Trunk Clothiers and try the aforementioned Boglioli as well as Barena and others. Hopefully the images above and below demonstrate some of the potential here. If you were to invest in one thing, it should be a tailored or made-to-measure jacket that could go with any casual trousers. Perhaps a pale grey herringbone cashmere? These don’t have to classic lace-ups. A smart pair of suede Adidas (don’t play football in them!) or leather Common Projects can be very smart. But lace-ups elevate you immediately to the level you want to play at. Buy a pair of brown lace-ups that will seem too expensive (Crockett & Jones, Grenson, Alfred Sargent), look after them, and wear them with casual trousers and even suits. If you rarely wear formal clothing, the second pair should be exactly the same, but in suede. Just as stylish, not quite as formal. I hope that’s helpful Alex. There’s so much to say… (also consider collared shirts, including polos; most men look better in a polo or proper shirt than a T-shirt). You can follow the discussion on How to dress casually: Reader question by entering your email address in the box below. You will then receive an email every time a new comment is added. These will also contain a link to a page where you can stop the alerts, and remove all of your related data from the site. you forgot ditch the T-shirt. Maybe it is just me but I think a well fitted polo, or casual collared shirt (chambray, oxford, etc.) are really important to looking more sophisticated in ones casual dressing. Hello Simon, Some great tips for Alex here,the shoes really make the difference. That is for sure. I don’t like chinos myself so I steer towards different coloured denim such as rust or green,again simple cut styles and avoid the overly distressed. I too loved the “Everyman needs a good blazer” post. I recently followed that advice and got a Navy hopsack blazer w/ genuine horn buttons. It is so versatile. 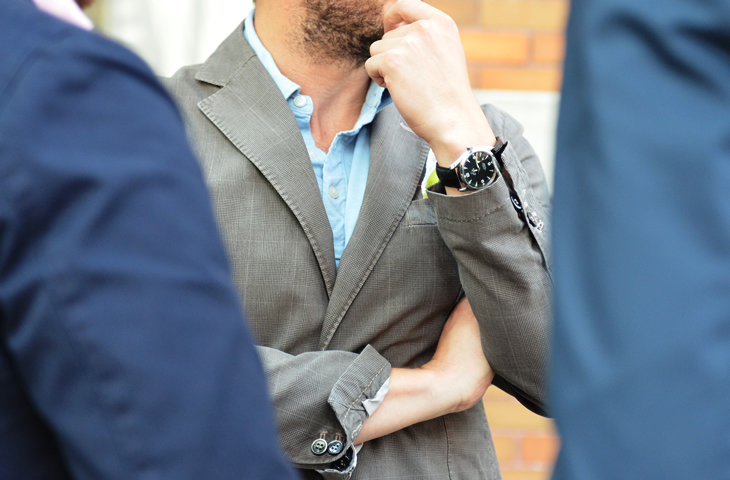 Now I would like to focus on the above mentioned unstructured jacket. Keeping in mind that I have a navy blazer, what color would you recommend for this jacket to achieve maximum versatility? What’s a reasonably price for good woollen trousers? And how much is too much?I saw a pair of black striped trousers with side fasteners in Hackett, but isn’t £200 a bit too much for RTW? It entirely depends on the quality of the work. The problem really is assessing that, which is not easy (much harder than for suits). Incotex trousers cost £200, but I think they’re worth it. Permanent Style generation keeps rising! Lately,I have started pondering on the kind of event you could well envision that would be an occasion for all these folks out there to meet and share their experience and pleasure as fellows! It might be a rewarding & enjoyable moment! It’s a good point John, I’ve been thinking about something similar. At the very least, we will do a book launch for my new book next year, and we could do some kind of meeting around one of the trunk shows perhaps. Yes, this could be a very good opportunity indeed, Simon. 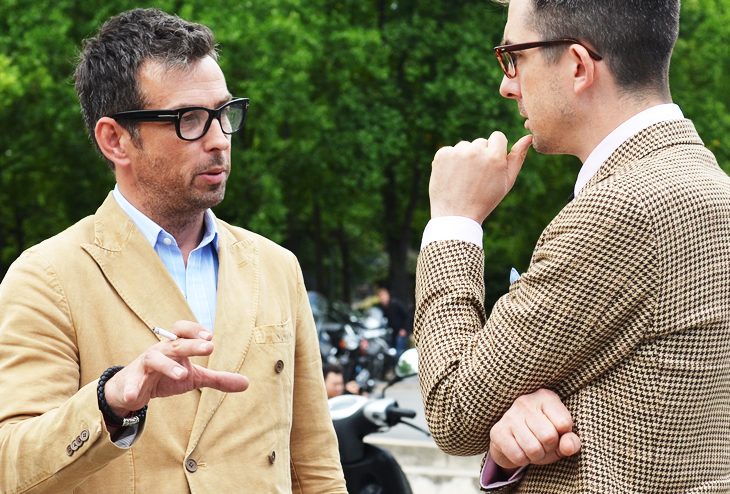 Yet there would be a need to draw lessons from all previous experiences attempted so far in this field – by the way not that much – and to see about how what you have been adumbrating could serve as an exploratory tool for a more workable project centered around menswear. Not only is London a strategic site, but there are also enough stakeholders who might well have a real interest in any sound venture designed to give more attention to menswear in today world. From my perspective, Permanent Style could be instrumental in many respects. Just stick to what you already have in mind and keep it in progress. Great article, it’s answering a problem tht many young guys have. I have recently started to completely change my wardrobe and style because I finaly have managed to lose enough weight. Now I still have about 1500 euros from my new wardrobe budget. If it’s not too much trouble, could you tell me what else should I get? I mention that I already have a tan trench coat and a overcoat and I will not buy any more untill the sales in January. Wow. That sounds good, and impressively planned. Some good knitwear perhaps? Drake’s sleeveless cardigans? I have a navy and a cream – the former is classic and goes with everything, the latter adds a touch of dandy to any outfit. There isn’t a lot to a tie, but the small things add up to a noticeable difference. There’s lots of information on this site about how Drake’s are made and about the designs and dying. Have a search. Simon, this has been one of your most wonderful blog posts. I am still at university, and reading this post makes me feel like a father figure or older brother is giving me advice. I was wondering, what is your opinion of Gant? Particularly, their shirts? Where is a good place to shop for reasonably priced shirts- the kind that would go with the casual dressing you have described. Thanks, Aldous Bertram. Thank you Aldous, you’re very kind. I do try to keep some practical advice mixed in with the idiosyncratic craft stories. as much as I agree with Simon, I’d like to add my own little bit of advice- watches! Just like wearing good clothes and cheap shoes is a no-no, so is a poor quality watch- make an investment, you should be spending at least £1000 on a watch, the best advice is to buy nearly new, or a vintage Omega or Rolex (or Patek if you can afford it). Money spent on a quality watch is almost never lost. If you don’t want to go the mechanical route, get a high end Japanese quartz, The Citizen or Grand Seiko, either run from £1200 upwards, depending on metal. They may seem expensive for watches wearing mundane brand names, but the quality even surpasses some swiss high end brands, and they’re hand finishes and assembled. They also have suberb mechanical models. You’ll have to get them from a Japanese dealer like Higuchi as they don’t sell outside of Japan (apart from some Grand seiko). You can carry off being stylish driving a natty old car, but not wearing a cheap watch- it reaks of bad taste. I can’t agree with this in the slightest – it’s just snobbery. There are many of us who can’t afford to be ‘spending at least £1000 on a watch’. I fail to see how this entails that we must have bad taste. Some of the most stylish and tasteful people I know are ones that come form very humble backgrounds and almost exclusively buy their clothes from charity shops. Clothes are different to watches anyway – they’re permanently on show, whereas a watch is (or should be) hidden, so I don’t agree that wearing an inexpensive one should constitute an act of bad taste. Yes! In any case the smart phone has replaced the watch as the number one gadget to own! I’ve got a simple DW watch where you can swap the strap according to your other leather accessories. You have to move with the timed. Totally agree with paying a bit more for shoes though! I’m not sure of the value of t-shirts Polo shirts, shirts and jeans beyond a certain price point though! meant for sports/tweed coats and not for city wear/dinner/smoking jackets? Slanted pockets are a little racier, where straight pockets are ordinary, the norm. Slanted is not for dinner wear though. I agree with you about proper trousers and good shoes, but cannot see that putting on a jacket ” elevates the leve of clothing AT ALL. The tieless-but-jacketed look is an abomination.